Granted, a dorm room probably has limited wall space and fire codes that might dictate what you can hang, but… make use of whatever wall space you have! Employ Command Strips if need be or simply rest frames on flat surfaces. I’ve also linked a removable wallpaper. If you’re wall are cinderblock, wallpaper might not work, but… the back of your door or the drawers of your desk could get a temporary makeover! Cover those walls! Make it fun. Make it colorful. You WILL have a bed, so gussy that old gal up! Grab a fun duvet cover. Get a cozy throw. 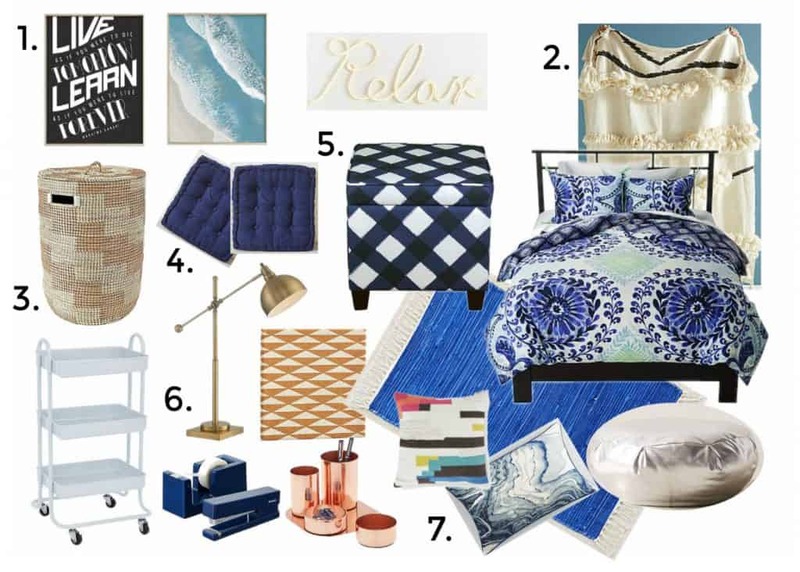 It’s likely that your bed will be 50% of the real estate in your dorm room so… make good use of it style wise! When I was in college, I had a FULL car load of stuff to unpack into my room. Shoes and hats and gloves and other silly things like text books and school supplies. The desk I was given had precisely 2 drawers so… there was a major need for storage. The cuter, the better! Assuming there’s ever an occasion to socialize between studying… it’s nice to have some space for your friends to hang out. Besides your bed, that is. And your desk chair. Floor cushions and poufs and cushy ottomans are your FRIEND! Get them! Get them ALL! What if one of those comfy ottomans doubled as storage? I mean… that would be even better, right? How about a really stylish cork board? Great! Utility cart that doubles as a bedside table? Why not?! Reversable rug? Duh?! Think multipurpose. Think ‘kill two birds with one stone’. With limited space… make your things work extra hard for you! My desk had a jar of pens and that was it, but… these desk accessories are too good to pass up. A stylish desk lamp and some chic desk accessories will help make that boring ol’ laminate furniture a little more bearable. For a final touch of dorm room awesomeness… grab some cool throw pillows… a few fun toys and get ready to soak up the next four years!